This daguerreotype taken at Mount Holyoke, December 1846 or early 1847 is the only authenticated portrait of Emily Dickinson later than childhood. The original is held by Amherst College Archives and Special Collections. Emily Elizabeth Dickinson (December 10, 1830 – May 15, 1886) was an American poet. Dickinson was born in Amherst, Massachusetts. Although part of a prominent family with strong ties to its community, Dickinson lived much of her life in reclusive isolation. After studying at the Amherst Academy for seven years in her youth, she briefly attended the Mount Holyoke Female Seminary before returning to her family's house in Amherst. Considered an eccentric by locals, she developed a noted penchant for white clothing and became known for her reluctance to greet guests or, later in life, to even leave her bedroom. Dickinson never married, and most friendships between her and others depended entirely upon correspondence. Dickinson was a recluse for the later years of her life. While Dickinson was a prolific private poet, fewer than a dozen of her nearly 1,800 poems were published during her lifetime. The work that was published during her lifetime was usually altered significantly by the publishers to fit the conventional poetic rules of the time. Dickinson's poems are unique for the era in which she wrote; they contain short lines, typically lack titles, and often use slant rhyme as well as unconventional capitalization and punctuation. Many of her poems deal with themes of death and immortality, two recurring topics in letters to her friends. Although Dickinson's acquaintances were most likely aware of her writing, it was not until after her death in 1886—when Lavinia, Dickinson's younger sister, discovered her cache of poems—that the breadth of her work became apparent to the public. Her first collection of poetry was published in 1890 by personal acquaintances Thomas Wentworth Higginson and Mabel Loomis Todd, though both heavily edited the content. A complete, and mostly unaltered, collection of her poetry became available for the first time when scholar Thomas H. Johnson published The Poems of Emily Dickinson in 1955. Despite some unfavorable reception and skepticism over the late 19th and early 20th centuries regarding her literary prowess, Dickinson is now almost universally considered to be one of the most significant of all American poets. Dickinson was troubled from a young age by the "deepening menace" of death, especially the deaths of those who were close to her. When Sophia Holland, her second cousin and a close friend, grew ill from typhus and died in April 1844, Emily was traumatized. Recalling the incident two years later, Emily wrote that "it seemed to me I should die too if I could not be permitted to watch over her or even look at her face." She became so melancholic that her parents sent her to stay with family in Boston to recover. With her health and spirits restored, she soon returned to Amherst Academy to continue her studies. During this period, she first met people who were to become lifelong friends and correspondents, such as Abiah Root, Abby Wood, Jane Humphrey, and Susan Huntington Gilbert (who later married Emily's brother Austin). During the last year of her stay at the Academy, Emily became friendly with Leonard Humphrey, its popular new young principal. After finishing her final term at the Academy on August 10, 1847, Dickinson began attending Mary Lyon's Mount Holyoke Female Seminary (which later became Mount Holyoke College) in South Hadley, about ten miles (16 km) from Amherst. She was at the seminary for only ten months. Although she liked the girls at Holyoke, Dickinson made no lasting friendships there. The explanations for her brief stay at Holyoke differ considerably: either she was in poor health, her father wanted to have her at home, she rebelled against the evangelical fervor present at the school, she disliked the discipline-minded teachers, or she was simply homesick. Whatever the specific reason for leaving Holyoke, her brother Austin appeared on March 25, 1848, to "bring [her] home at all events". Back in Amherst, Dickinson occupied her time with household activities. She took up baking for the family and enjoyed attending local events and activities in the budding college town. Dickinson was familiar not only with the Bible but also with contemporary popular literature. She was probably influenced by Lydia Maria Child's Letters from New York, another gift from Newton (after reading it, she gushed "This then is a book! And there are more of them!"). Her brother smuggled a copy of Henry Wadsworth Longfellow's Kavanagh into the house for her (because her father might disapprove) and a friend lent her Charlotte Brontë's Jane Eyre in late 1849. Jane Eyre's influence cannot be measured, but when Dickinson acquired her first and only dog, a Newfoundland, she named him "Carlo" after the character St. John Rivers' dog. William Shakespeare was also a potent influence in her life. Referring to his plays, she wrote to one friend "Why clasp any hand but this?" and to another, "Why is any other book needed?" During the 1850s, Emily's strongest and most affectionate relationship was with her sister-in-law, Susan Gilbert. Emily eventually sent her over three hundred letters, more than to any other correspondent, over the course of their friendship. Susan was supportive of the poet, playing the role of "most beloved friend, influence, muse, and adviser" whose editorial suggestions Dickinson sometimes followed, Sue played a primary role in Emily's creative processes." Sue married Austin in 1856 after a four-year courtship, though their marriage was not a happy one. Edward Dickinson built a house for Austin and Sue naming it the Evergreens, a stand of which was located on the west side of the Homestead. There is controversy over how to view Emily's friendship with Susan; according to a point of view first promoted by Mabel Loomis Todd, Austin's longtime mistress, Emily's missives typically dealt with demands for Sue's affection and the fear of unrequited admiration. Todd believed that because Sue was often aloof and disagreeable, Emily was continually hurt by what was mostly a tempestuous friendship. 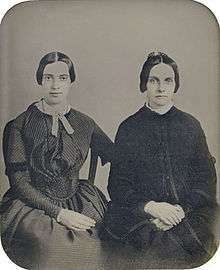 However, the notion of a "cruel" Susan—as promoted by her romantic rival—has been questioned, most especially by Sue and Austin's surviving children, with whom Emily was close. Around this time, Dickinson's behavior began to change. She did not leave the Homestead unless it was absolutely necessary and as early as 1867, she began to talk to visitors from the other side of a door rather than speaking to them face to face. She acquired local notoriety; she was rarely seen, and when she was, she was usually clothed in white. Dickinson's one surviving article of clothing is a white cotton dress, possibly sewn circa 1878–1882. Few of the locals who exchanged messages with Dickinson during her last fifteen years ever saw her in person. Austin and his family began to protect Emily's privacy, deciding that she was not to be a subject of discussion with outsiders. Despite her physical seclusion, however, Dickinson was socially active and expressive through what makes up two-thirds of her surviving notes and letters. When visitors came to either the Homestead or the Evergreens, she would often leave or send over small gifts of poems or flowers. 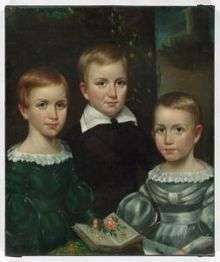 Dickinson also had a good rapport with the children in her life. Mattie Dickinson, the second child of Austin and Sue, later said that "Aunt Emily stood for indulgence." MacGregor (Mac) Jenkins, the son of family friends who later wrote a short article in 1891 called "A Child's Recollection of Emily Dickinson", thought of her as always offering support to the neighborhood children. Although she continued to write in her last years, Dickinson stopped editing and organizing her poems. She also exacted a promise from her sister Lavinia to burn her papers. Lavinia, who also never married, remained at the Homestead until her own death in 1899. 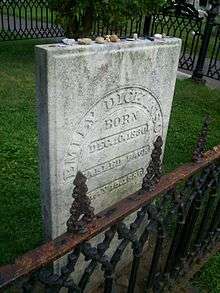 Dickinson was buried, laid in a white coffin with vanilla-scented heliotrope, a Lady's Slipper orchid, and a "knot of blue field violets" placed about it. 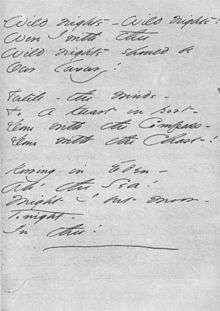 The funeral service, held in the Homestead's library, was simple and short; Higginson, who had met her only twice, read "No Coward Soul Is Mine", a poem by Emily Brontë that had been a favorite of Dickinson's. At Dickinson's request, her "coffin [was] not driven but carried through fields of buttercups" for burial in the family plot at West Cemetery on Triangle Street. 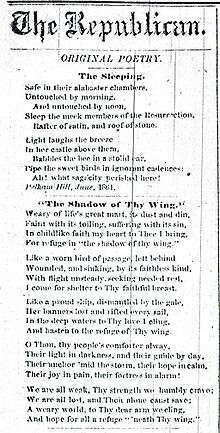 "Safe in their Alabaster Chambers –," entitled "The Sleeping," as it was published in the Springfield Republican in 1862. Nearly a dozen new editions of Dickinson's poetry, whether containing previously unpublished or newly edited poems, were published between 1914 and 1945. Martha Dickinson Bianchi, the daughter of Susan and Edward Dickinson, published collections of her aunt's poetry based on the manuscripts held by her family, whereas Mabel Loomis Todd's daughter, Millicent Todd Bingham, published collections based on the manuscripts held by her mother. These competing editions of Dickinson's poetry, often differing in order and structure, ensured that the poet's work was in the public's eye. 1861–1865. This was her most creative period—these poems are more vigorous and emotional. Johnson estimated that she composed 86 poems in 1861, 366 in 1862, 141 in 1863, and 174 in 1864. He also believed that this is when she fully developed her themes of life and death. In the early 20th century, Dickinson's legacy was promoted in particular by Martha Dickinson Bianchi and Millicent Todd Bingham. Bianchi, who had inherited The Evergreens as well as the copyright for her aunt's poetry from her parents, published works such as Emily Dickinson Face to Face and Letters of Emily Dickinson, which stoked public curiosity about her aunt. Her books perpetrated the myths surrounding her aunt, while combining family tradition, personal recollections, and pieces of correspondence. In comparison, Millicent Todd Bingham's works provided a more distant and realistic perspective of the poet. Emily Dickinson is now considered a powerful and persistent figure in American culture. Although much of the early reception concentrated on Dickinson's eccentric and secluded nature, she has become widely acknowledged as an innovative, pre-modernist poet. As early as 1891, William Dean Howells wrote that "If nothing else had come out of our life but this strange poetry, we should feel that in the work of Emily Dickinson, America, or New England rather, had made a distinctive addition to the literature of the world, and could not be left out of any record of it." Twentieth-century critic Harold Bloom has placed her alongside Walt Whitman, Wallace Stevens, Robert Frost, T. S. Eliot, and Hart Crane as a major American poet, and in 1994 listed her among the 26 central writers of Western civilization. Dickinson is taught in American literature and poetry classes in the United States from middle school to college. Her poetry is frequently anthologized and has been used as texts for art songs by composers such as Aaron Copland, Nick Peros, John Adams and Michael Tilson Thomas. Several schools have been established in her name; for example, two Emily Dickinson Elementary Schools exist in Bozeman, Montana, and Redmond, Washington. A few literary journals—including The Emily Dickinson Journal, the official publication of the Emily Dickinson International Society—have been founded to examine her work. An 8-cent commemorative stamp in honor of Dickinson was issued by the United States Postal Service on August 28, 1971 as the second stamp in the "American Poet" series. A one-woman play entitled The Belle of Amherst first appeared on Broadway in 1976, winning several awards; it was later adapted for television. Jane Campion's film The Piano and its novelization (co-authored by Kate Pullinger) were inspired by the poetry of Emily Dickinson as well as the novels by the Bronte Sisters. The soundtrack to the film, written and composed by Michael Nyman contained songs with titles directly extracted from Dickinson's poetry such as Big My Secret and most famously The Heart Asks Pleasure First. The former is one of Nyman's most notable works to date and a signature piece of his repertoire. The cello rock band Rasputina drew inspiration from Dickinson for their 2010 album Sister Kinderhook. The songs Sweet Sister Temperance and My Porcelain Life are based specifically on the life of Dickinson. Dickinson has also played a role of personal inspiration for Rasputina's front woman Melora Creager for a number of years. 1 2 McNeil (1986), 2. ↑ "Dickinson, #657". itech.fgcu.edu. Retrieved 2016-09-12. 1 2 Sewall (1974), 337. 1 2 Habegger (2001), 129. 1 2 Wolff (1986), 77. 1 2 3 Ford (1966), 18. 1 2 Habegger (2001), 168. 1 2 Pickard (1967), 19. 1 2 Habegger (2001), 221. 1 2 Habegger (2001), 226. 1 2 3 Habegger (2001). 342. 1 2 Habegger (2001), 353. ↑ Habegger (2001), 376; McNeil (1986), 33. ↑ McDermott, John F. 2000. 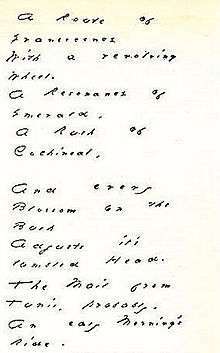 "Emily Dickinson's 'Nervous Prostration' and Its Possible Relationship to Her Work". 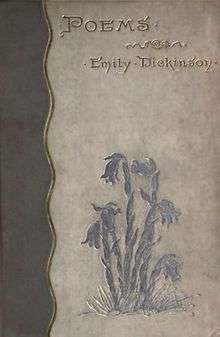 The Emily Dickinson Journal. 9(1). pp. 71–86. ↑ "A bomb in her bosom: Emily Dickinson's secret life". The Guardian. February 13, 2010. Retrieved August 20, 2010. ↑ Wolff (1986), 188, 258. ↑ Habegger (2001), 501; Murray (1996), 286–287. ↑ Habegger (2001), 502; Murray (1996), 287. 1 2 Habegger (2001), 547. 1 2 3 Farr (2005), 3–6. ↑ "The Lost Gardens of Emily Dickinson". The New York Times. 17 May 2016. 1 2 3 Parker, G9. ↑ Habegger (2001: 587); Sewall (1974), 642. ↑ Habegger (2001), 592; Sewall (1974), 653. 1 2 Habegger (2001), 627. 1 2 Wolff (1986), 535. 1 2 3 4 Ford (1966), 32. 1 2 Sewall (1974), 580–583. 1 2 3 4 Farr (1996), 3. 1 2 Wolff (1986), 537. ↑ McNeil (1986), 34; Blake (1964), 42. 1 2 3 Martin (2002), 17. 1 2 Pickard (1967), 20. 1 2 Johnson (1960), viii. 1 2 Hecht (1996), 153–155. 1 2 3 4 Farr (2005), 1–7. 1 2 3 Farr (1996), 7–8. 1 2 3 4 Pollak (1996), 62–65. 1 2 3 Juhasz (1996), 130–140. ↑ "Emily Dickinson". Emily Ezust's Lied and Art Song Texts website. Retrieved January 18, 2008. ↑ "Mission Statement". Emily Dickinson School website, Bozeman, Montana. Archived from the original on October 2, 2007. Retrieved January 16, 2008. 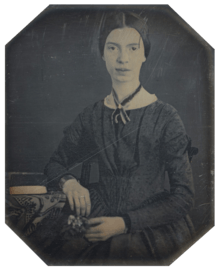 ↑ "The Real Emily Dickinson". Emily Dickinson Elementary School website, Redmond, Washington. Retrieved July 24, 2008. ↑ "The Emily Dickinson Journal". The Johns Hopkins University Press website, Baltimore. Retrieved December 18, 2007. ↑ "Emily Dickinson commemorative stamps and ephemera". Harvard University Library. Retrieved June 22, 2009. ↑ "Belle of Amherst". 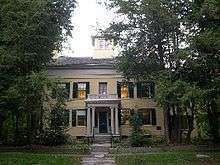 Emily Dickinson Museum. Retrieved September 23, 2010. 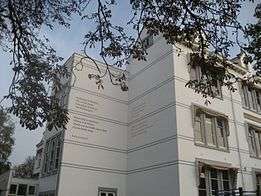 ↑ "Emily Dickinson's Herbarium". Harvard University Press. Retrieved August 4, 2011. ↑ "Dickinson, Emily, 1830–1886. Herbarium, circa 1839–1846. 1 volume (66 pages) in green cloth case; 37 cm. MS Am 1118.11, Houghton Library". Harvard University Library. Retrieved August 4, 2011. ↑ "Emily Dickinson Collection". Jones Library, Inc. website, Amherst, Massachusetts. Retrieved December 18, 2007. ↑ "History of the Museum". Emily Dickinson Museum website, Amherst, Massachusetts. Archived from the original on October 23, 2007. Retrieved December 13, 2007. ↑ "Tour and Home". Brooklyn Museum. 1979-03-14. Retrieved 2015-08-12. ↑ Davis Langdell, Cheri. "Pain of Silence". Retrieved 21 August 2013. ↑ Stratosphere Fanzine, Jen. "Rasputina -Sister Kinderhook". Adequacy. Retrieved 21 August 2013. ↑ Raggett, Ned. "Rasputina Review". Retrieved 21 August 2013. ↑ Tucker, Mark S. "Fame Review: Rasputina – Sister Kinderhook". Retrieved 21 August 2013. ↑ Polacheck, Angeliska. "Melora Creager: Sweet Sister Temperance". Coil House. Retrieved 21 August 2013. 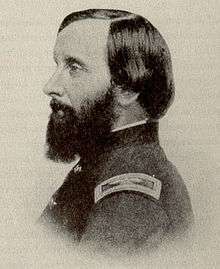 Johnson, Thomas H. (ed). 1960. The Complete Poems of Emily Dickinson. Boston: Little, Brown & Co.